LISA seeks to explore an entirely different kind of gravitational wave, ripples that change the shape of space itself, than its Earth-based counter parts, LIGO. Three spacecraft will orbit in a triangle behind Earth, each separated by 2.5 million kilometres (around 1.5 million miles). Aside from the enormous distances involved, the function of LISA and the LIGO experiments is essentially the same. Each ship contains a pair of cubes which serve as reference points, and lasers between them. LISA detects gravitational waves by comparing the distance the lasers travel, and compares the lasers to see a gravitational wave’s properties. Longer distances allow the system to measure longer wavelength gravitational waves, ones that take much longer to get from peak to peak. But probably most importantly, LISA will hunt for a whole different class of gravitational waves. As of now, LIGO only looks for gravitational waves produced by colliding stellar mass black holes—those on the order of tens of times the mass of our own Sun. Supermassive black holes at galactic centres are more like billions of times the Sun’s mass, so their waves are much, much longer, far too long for LIGO’s four-kilometre arms to detect. A 2.5 million kilometre arm opens up an entirely different realm, like the difference between using binoculars and a space-based telescope. All of this is taking a long time because scientists have been sceptical about gravitational waves prior to the February, 2016 announcement, explained Bartos. Physicist Joe Weber claimed to see gravitational waves back in 1969, but others couldn’t recreate his results, increasing folks’ scepticism. 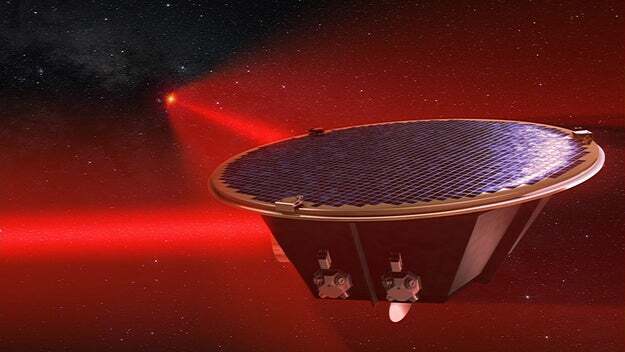 NASA decided not to prioritise LISA back in 2011, and pulled out of the mission. But now that LIGO has confirmed gravitational waves’ existence, it appears that NASA wants to rejoin. There are other proposed ways to spot gravitational waves as well, by the way, by using pulsars, neutron stars rotating so regularly that they essentially tick like cosmic clocks.